See a brief overview of Leister's extruder line to help you pick the one for your application. The new WELDPLAST S1 from Leister is outstandingly compact. The WELDPLAST S1 is the ideal tool for small fabrication shops. Ergonomically designed, the WELDPLAST S2 features a revolutionary brushless, maintenance-free motor for generating preheated air. Compact and ergonomically designed, the WELDPLAST S4 features a revolutionary brushless, maintenance free motor for generating preheated air. 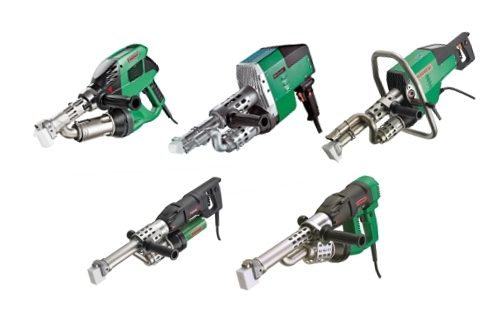 The most powerful hand extruder on the market. It was designed specially for the requirements of geomembrane welding. As a result of its extremely compact design and rotatable handle, FUSION 2 is specially suited for tight spaces. Easy operation due to its ergonomic, slim line design. With a designed length of 670 mm, the FUSION 3 is ideally suited to use in geomembrane welding. Easy operation due to its compact design. With a designed length of 580 mm, the FUSION 3C is ideally suited to use for high output use in plastic fabrication.